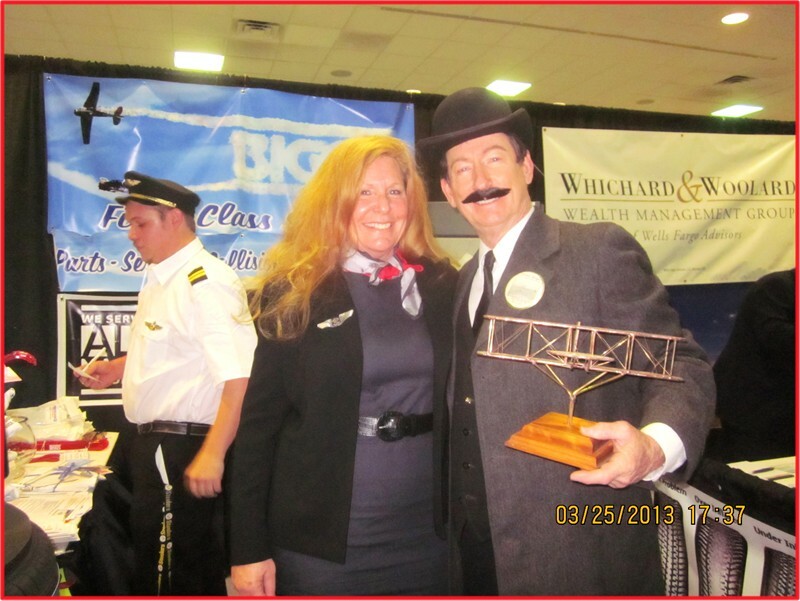 Orville Wright Impersonator for speaking, appearances, special events. As the first man of flight and national - world hero of pioneering manned flight for the first time in history, Orville Wright looms large in his legacy of courage, genius and positive thinking, that finally conquered the sky. Fate would have it that he would win the coin-toss to see if he or Wilbur Wright, his brother and coinventor of the airplane, would be the first man to ever fly on that glorious day in Kitty Hawk, NC December 17, 1903. Poignantly, at the beginning of the very new and exciting 20th century, man had finally broken the bonds of earth with a machine that, unlike a balloon, could actually be controlled and connect great distances with remarkable speed. This would be the beginning of the popular optomistic phrase and philosophy of life, "the sky's the limit!" and nullified the expression "it'll never fly!" 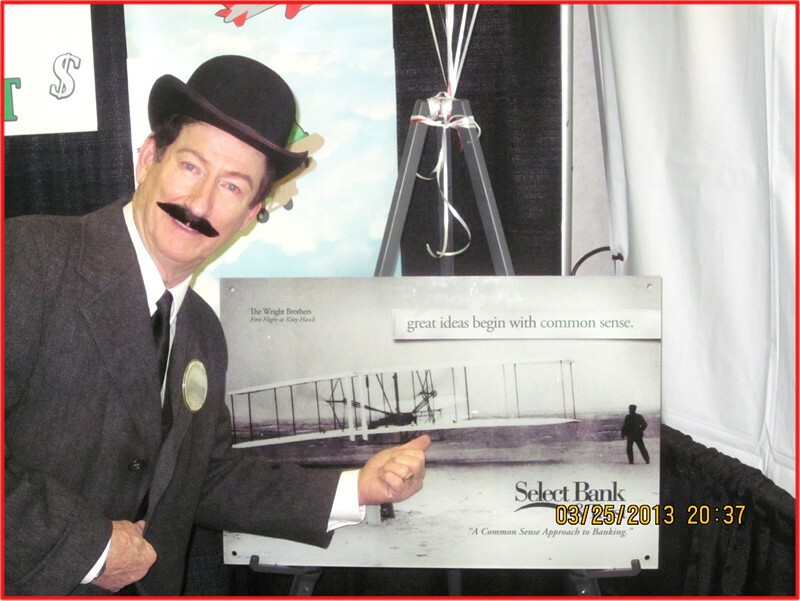 Tim Beasley, a professional speaker and variety celebrity impersonator - actor of popular historical icons, has captured the essence of "Orville Wright" in a wonderfully accurate time-travel re-enactment of this great man. In both looks and physical traits, Tim shares his disctinctive tall and lean posture, sculpted facial features, visionary countenance and confident stance. 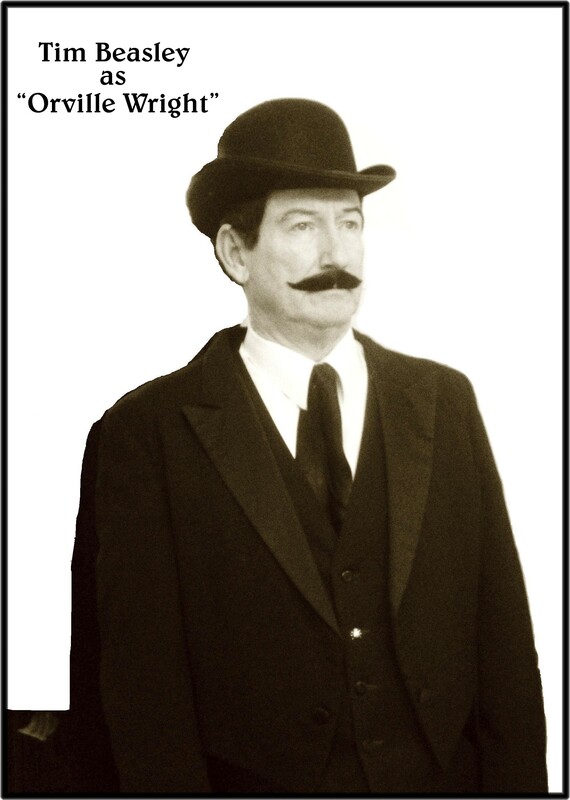 Notable in appearance, sporting his signature dapper derby and overcoat, grand mustache and confident demeanor, he's an instantly recognized giant of history. For special events relative to flight and history, Tim also speaks on the inner - genius that was Orville Wright, by speaking as "Orville" in first person with quotes and conversation based on the notes and historical documents Orville created during his years of "early 20th Century Superstar" fame. Here are a few photos from a very recent professional appearance as a "traffic - builder" icon and meet & greet ambassador for a large GM dealership at theIr local Elizabeth City, NC ( in the relative area of North Carolina, very close to Kitty Hawk, NC.) 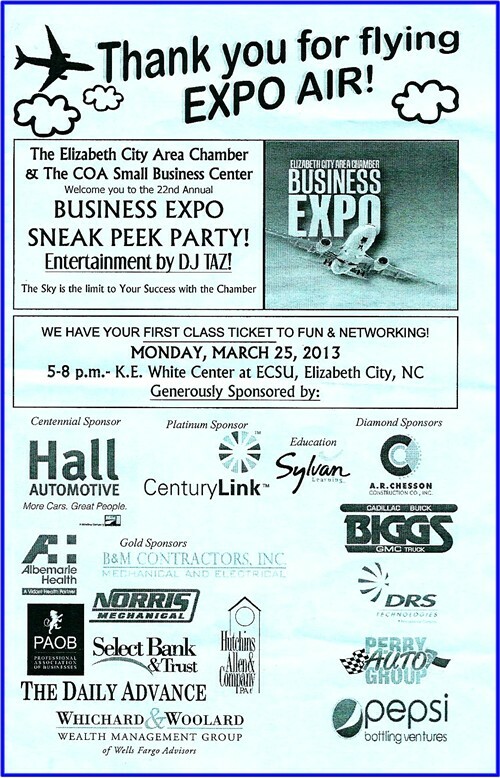 Chamber of Commerce Expo. Below, Tim with Michelle Hatfield of Biggs Buick - Cadillac - GMC, his direct client for the event, at their display which won the first place blue ribbon best new exhibitors! "Orville" is holding the Biggs grand door prize, a beautifully hand-crafted model (one of only 3!) of the Wright Brothers "Wright Flyer 1" which was made by the way, by Michelle! 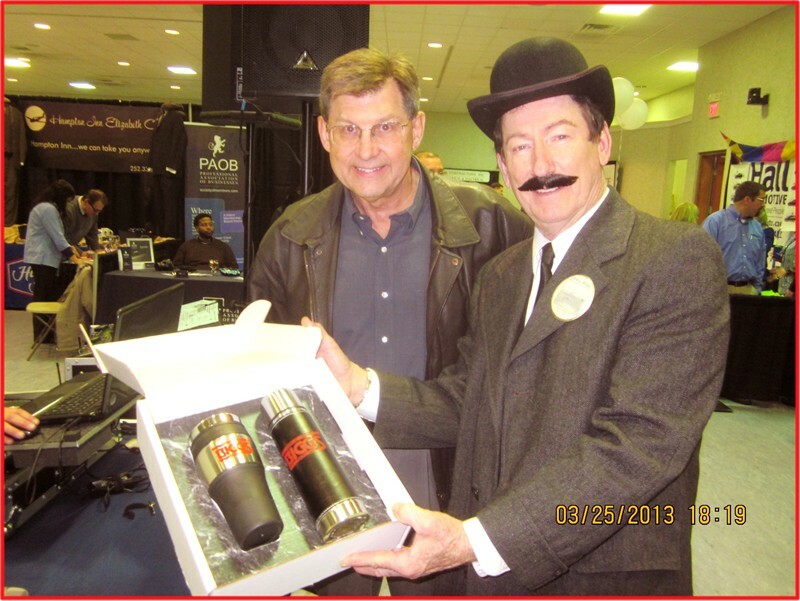 "Orville" awards a nice doorprize, one of many provided by Biggs throughout the VIP event. "Wright Flyer 1" scale model doorprize. 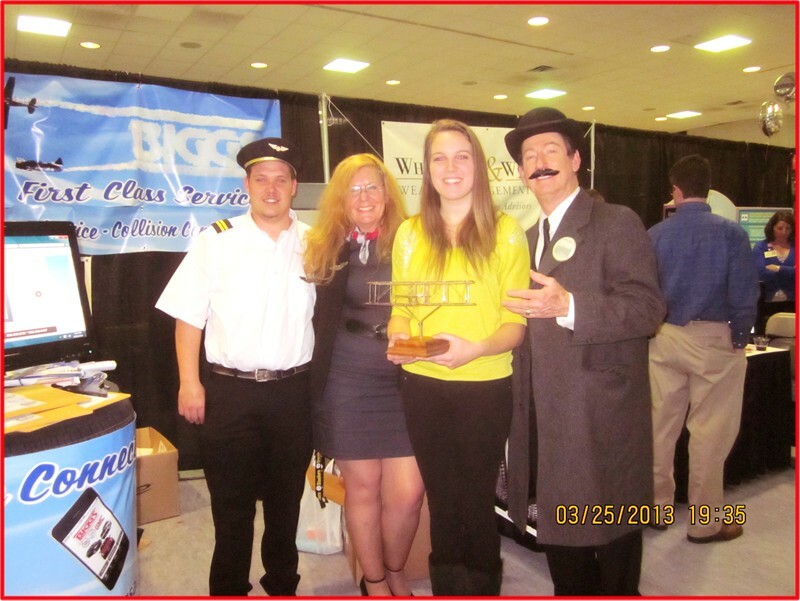 All of the Elizabeth City Chamber of Commerce exhibitors followed rhe "Flying Expo Air" theme. Available nationally -internationally for appearances, speaking engagements, motivational -imspirational - historical events.